Materials Included: Pattern, fabric bundle, & lunch. 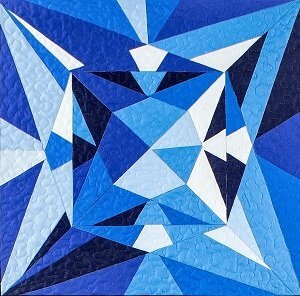 Instructor Bio: Merritt Crawford has been making award winning quilts for over 18 years and has taught a variety of quilting classes for the past ten. Her classes are full of fun techniques that propel her students to achieve stunning results by paying attention to details. This love of detail inspired Merritt to become a Gem Affiliate. She enjoys teaching in all settings from quilt shop classrooms, to beautiful retreat centers, to local quilt guild venues. Quilting and creativity are a part of Merritt?s family heritage. Descended from a long line of creative women, Merritt knows that being creative is a part of who she is and desires to be. Even when she married her husband, she gained a sweet mother-in-love, who enjoyed the creative process of sewing and quilting, too.